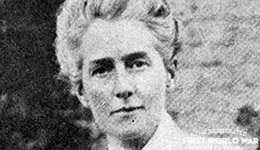 The execution of the British nurse Edith Cavell, for espionage, caused international outcry, amplifying anti-German feeling among the Allied Nations. At the outbreak of war, Cavell was running a nurse training school and medical clinic in Brussels. When the Germans occupied the city in late 1914, she became part of an undercover network which arranged the concealment and escape of allied soldiers. Cavell continued her nursing work during this period, occasionally disguising soldiers among her patients at the clinic. After the leader of this network was arrested, Cavell and one of her assistants were quickly taken into German custody. A total of nine people were put on trial for the activities of the network, and Cavell was among four sentenced to death on the 7 October 1915. Despite wide publicity and attempts to reverse the sentence through diplomatic channels, Cavell was executed five days later. The Illustrated London News reported these events with an outrage that was typical of public opinion. The execution of a female nurse was seen as an act of barbaric, unnecessary violence, and in Britain, it became a focal point for anti-German feeling. Writing in the paper, the author G.K. Chesterton used the event to highlight the contrasts between ‘brave’, ‘candid’ Britons and ‘mean’, ‘petty’ Germans. ‘She was especially the representative of a full and ripe civilization, as against that powerful half-civilisation which is attempting to destroy it.’ Soon after her death, The Illustrated London News predicted that public indignation would encourage the war effort, and ‘be felt at the recruiting offices and on the [battle]field.’ Her story and image were widely used in British and Allied propaganda and war appeals, appearing on postcards and recruitment posters and well as in newspapers. Men and women throughout the civilized world […] are moved to admiration and awe at her faith and courage in death. A national day of tribute was held on the 29th October 1915, and after the war she was given a funeral service at Westminster Abbey, with crowds lining the route of the funeral procession. The Illustrated London News emphasized Cavell’s heroism and martyrdom, publishing an ‘imaginary’ representation by the artist Amédée Forestier, which showed her death attended by an angel.